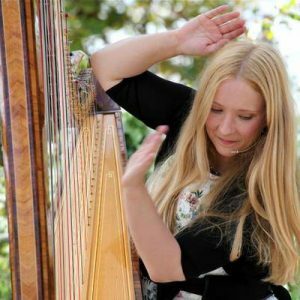 Shelley has a great passion to share the harp in all it’s many guises, from the Celtic and Traditional, to Classical, to Jazz and various Pop genres. It is her great aim to make harp concerts as engaging, diverse and joyful as possible on this incredible instrument. Following a Classical education on the pedal harp and many years of Celtic harp exploration, Shelley’s shows now also feature her new great passion, the electric harp. She performs both on an electroacoustic pedal harp and also on a 32 string fully electric harp (the “DHC Light”) which she wears on a harness and walks around with whilst playing. This offers a modern and dynamic edge to this beautiful traditional instrument. Shelley can be seen performing solo shows, usually 1 hour or alternatively two 40 to 45 minute sets (with interval), or can often be seen at solo appearances within concerts offering a variety of artists. What can you expect in Shelley’s Solo Concerts? Pythagoras proposed the intriguing idea that the Stars, Moon and Planets emit their own unique musical tones, he called it the Music of the Spheres. What if you could hear that? What if you could hear the shape of a sphere, the sound of our planets, the number Pi of as a melody, the circle of life in music? Shelley explores these fascinating notions in her performance on the Concert Pedal Harp and Electric Lever Harp. 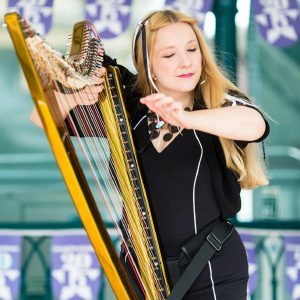 Come and join Shelley in the HarpOsphere where you will hear music ranging from our Celtic roots right through to music from the 21st Century. Harp Revelry is a concert music performed exclusively on Shelley’s wireless golden electric harp that she wears and walk around with whilst playing. The harp is amplified and also enhanced at times in the performance using a loop station and effects pedals. In this concert Shelley completely escapes from the static feeling of being sat behind a harp, as she can walk around and move easily, much like a solo violinist can. It makes playing music feel much more natural and free, a great escape indeed! Throughout generations tales have been told of three musical strands. The details differ in each story, but they’re always played by a harpist, and they always encompass the human experience. This is a tradition that’s not about “traditional music”, but a tradition of expression. Exploring this through the harp, every musician can create a completely unique style. Come and hear Shelley entwine The Three Strands. You can expect a wide diversity of guests at this musical gathering; we meet with our Celtic forefathers, Tchaikovsky, Beethoven, Flamenco Dancers and even Axl Rose, Darth Vader and Dr Who will make an appearance! The concert includes the use of a gold electric harp that Shelley wears to play, a looper pedal, effects pedals and an amplifed 47 string pedal harp. Be True to your Harp! 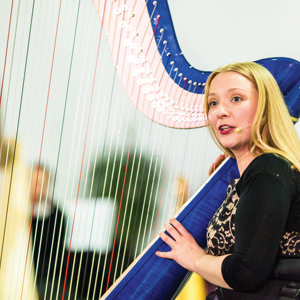 Try the Harp Sessions in Cardiff!